We were given a download code to try out and review the new app from Fingerprint called Kids Learn Mandarin. Our download code allows us the complete access to all 12 lessons on the app. Opinions of the app are 100% our own. A few years ago I got the idea in my head that I would like to learn Chinese. Mandarin Chinese actually. I bought books, started writing a bit of the language and even attended Chinese New Year celebration. I didn’t get, too far. I’d still like to learn the Chinese language but maybe I should start out a little smaller and try to get some basic lessons down. The way a kid would learn. So, when I get the chance to review language apps I generally say yes and try them out alongside my kids. The Kids Learn Mandarin app is nice because it teaches children the language through fun activities, a little movie and stickers. Each of the 12 lessons has 8 activities, 1 movie and 20 stickers. The lessons are broken down into Numbers, Colors & Shapes, Animals, Fruits & Vegetables, Family & Occupations, Body Parts, Clothes, Toys & Transport, Sports & Hobbies, Things at Home, Eating & Drinking and Nature & Outdoors. Kids can play the different lessons in any order that they’s like however they do build on each other and it would make sense to play them in order. The app doesn’t get into how the language is a tonal language and that there are four tones and how the accent marks make a difference in the pronunciation of a word. 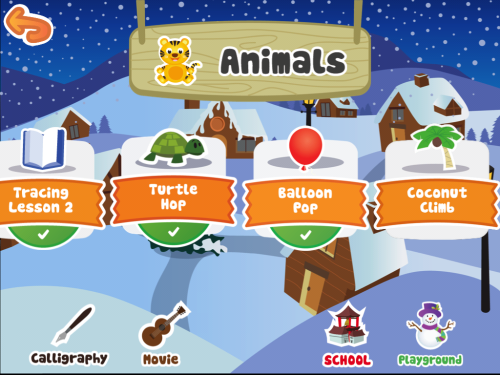 Rather, the app provides kids an interesting way to explore the language by playing games that reinforce the different words that they are learning. The characters from the games are colorful and engaging. Kids can even start practicing writing the words that they are learning through tracing activities that show the kids how a word is written. Eva tried a bunch of the lessons and played many of the games. She hasn’t been at t too long and so we’re not seeing explosive understanding of the language but it is engaging and keeping her entertained and motivated to learn more. SAN FRANCISCO, CA — (May 30, 2013) – Fingerprint continues to dismantle the great wall between entertainment and education with its newest learning app, Kids Learn Mandarin, available today exclusively on the Fingerprint network for iPad, iPhone and iPod Touch. Created in partnership with Hong Kong based Digital Learning Company, this immersive and vibrantly animated title improves on the original Kids Learn Mandarin app released in 2012, which was ranked as a Top 10 Education App in six countries. Kids Learn Mandarin for Fingerprint features the network’s acclaimed progress reporting, which provides interactive updates to parents on their child’s achievements, subject mastery and suggested next lesson. Kids Learn Mandarin takes a progressive and playful approach to teaching kids ages 3-8 a whopping 240 Mandarin words through 12 fully interactive lessons that cover a variety of subjects –numbers, colors, animals, food, sports, transportation and more. Hosted by Pei Pei the Panda, Kids Learn Mandarin includes 96 mini-games, 12 lively music videos, 12 Chinese character writing lessons and a personal playground that kids can decorate with stickers they earn as they learn! Mandarin, the national language of China, Taiwan, Hong Kong and Singapore, is spoken by more than 1 billion people worldwide and is considered one of the most important world languages by the U.S. State Department.1 In fact, more and more U.S elementary schools are teaching Mandarin in the classroom. By making early language learning accessible and appealing, Kids Learn Mandarin reaches kids during critical cognitive development and gives them a boost in life-long learning. Kids Learn Mandarin is available in the iTunes App Store with a version that’s right for every family: with individual lessons ($1.99), a Beginner Pack of five lessons ($4.99) and the Premium Pack with all 12 lessons ($7.99). The entire collection and many other great, kid-safe experiences can be found on the games page of the Fingerprint network. In fact, many of the apps, including Kids Learn Mandarin, offer free, lite versions to sample before buying. Fingerprint Digital is a mobile entertainment company for kids and the creator of Fingerprint Play, the first kids’ mobile learning and entertainment network, providing kid-safe gaming with a connection to parents. The Fingerprint network includes 28 edutainment apps from 13 countries. Fingerprint is funded by leading consumer tech investors including Corus Entertainment and K2MediaLabs. For more information, visit www.fingerprintplay.com or www.facebook.com/fingerprintplay. The Digital Learning Company was founded by marketing entrepreneur Kristy Carr and media executive Ian Carroll, two parents raising bi-lingual children in Hong Kong. 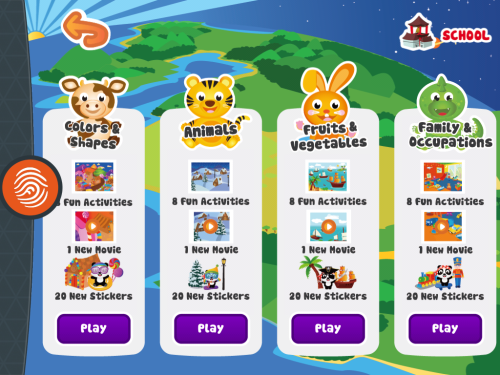 The Digital Learning Company believes that the best way to teach children a second language is through structured play with highly interactive theme-related games and songs.